Squat Rack 4.0 – Commercial Grade – Black- By B.o.S. Home/Power Racks, Power Racks, Performance Machines/Squat Rack 4.0 – Commercial Grade – Black- By B.o.S. 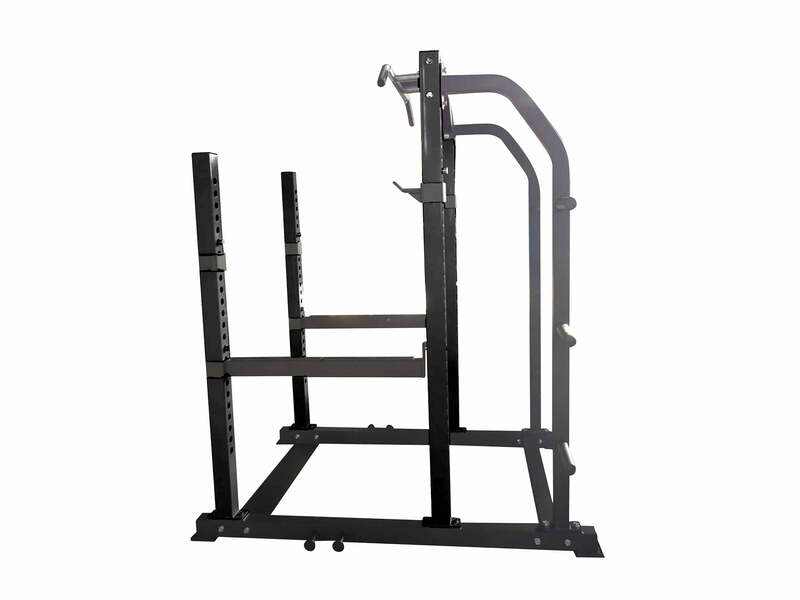 A heavy duty commercial rack geared towards high traffic small gyms and studios, with a wide open squatting area with band pegs and a chin up bar. The Monolift Attachment is compatible by bolting on to any of our racks and rigs. The monolift attachment offers a space-saving and inexpensive monolift solution. Lined with UHMW plastic it'll do minimal damage to your bar. A portable and inexpensive solution for doing pulley based exercises that can be anchored to racks or stand-alone pull up bars. Ships FREE in Canada! Ordering and shipping issues aside, I like the rack. Assembly was easy, it looks really good. The plastic in the j-hooks is scraping away from my OPB, which I prefer over wearing out the bar. The safeties can be a bit tough to line up but you get the hang of it. My issue is the band pegs. They are so close together I can't deadlift or floor press in the rack. I also cant figure out how to use bands with them. They are so close together, the band's become totally slack and fall off. I have tried looping the bands and velcro straps and zip ties and none of it works. I am using BOS bands I bought at the same time. Does BOS have suggestions for me or do I need to cut them off and weld them back on in the position they are normally designed? Squat Rack 4.0 - Commercial Grade By B.o.S. I've bought this rack about 7 months ago. It's a solid product that deserved a review. Bought this model because it was the perfect height for my basement. Bells of Steel has upgraded their residential and light commercial racks since then and offers other low ceiling cages. I guess this model is not the best seller but I hope they will continue to offer upgrades for it, I really enjoy this setup. Pros: - The open top design allows to get bars in and out of the cage easily when training in a narrow room. - Tough, simple, built to last for generations - Plate storage, unmovable rack - Aggressive knurlings & multiple grip on the chin-up bar Cons: - Welded, fixed band pegs at the bottom. Can't do deadlifts or floor presses inside the rack because the plates would hit the pegs. - The metal sheet on the floor that links the front uprights makes my feet slip while benching (I train barefoot or in socks). I personally removed this piece but it's there for a stability reason. My Wishlist : 3x3 Nylon Roller J-Cups & Nylon Sandwich J-Cups Commercial 3x3 Dip Attachment I cant seem to find where to buy separately in the rack attachments page. New foundations for the rack with removable band pegs or spread apart setup to allow banded deadlifts, etc. Perfect for the basement with lower ceiling restrictions. Extremely well constructed, balanced and solid. Assembled with no problems whatsoever.No missing parts. I searched the internet for a rack for a long time. Everywhere else was at least twice the price for a rack of this construction. Not to mention,shipping was expensive. Did I mention Bells of Steel offers free shipping to several locations.All my questions were answered promptly by Kaevon Khoozani. It's a no brainer. If you are looking for a rack that can do most free weight exercises,look no further!! Hey Brady, thanks for the review! This rack is very solid and you cannot beat the price point. Yes, the free shipping is a great feature too! Great for low ceiling basements. I was hesitant when i got this because my basement ceiling height was only 88" high. But w/ this rack I've been even able to do pullups as well as all my other barbell based exercises. Very sturdy as I've failed and had to drop the weight onto the saftey bars. I also love the yellow and black paint scheme as it reminds me that its time to 'get to work!'. Definite buy for the value and price. Hey Bob, thank you for the review! The commercial squat rack is great for the lower ceiling as it does allow you to still get in the exercises you need to be successful! Keep up the great work! The larger frame and no top allows the lifter to freely move; press over head without restriction, do a wide stance squat and enjoy the experience of open movement without sacrificing safety. A power rack, also known as a power cage, or squat rack, allows you to efficiently and safely perform a number of barbell exercises. 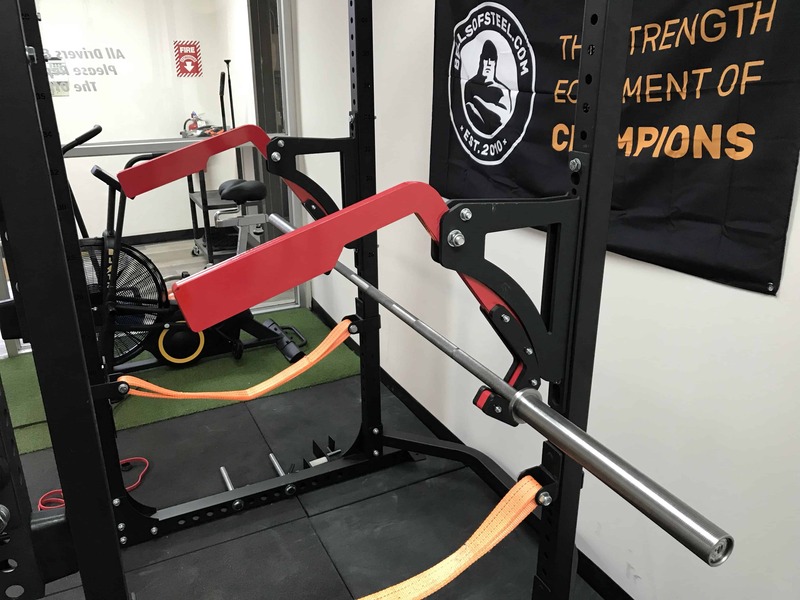 Our Squat racks have adjustable j-hooks that allow you to set the height of the bar, for example, setting them to a squat height or bench height, and safety catches that prevent the weight from going beyond a certain point. Here is a breakdown of the major benefits realized from using the commercial grade Squat rack. Bench, squat and chin ups are the main exercises you can do. With the Commercial Power Rack, you have the added benefit of adjustable band pegs on the bottom of the rack. This allows you to attach strength bands to your bar and create a variable plane of resistance to help bust through training plateaus. For more training ideas check out coach Poliquin’s site.